With politicians around the globe calling on Israel to take action against illegal settlements in the West Bank, the Jewish state has finally taken action. Not against its own communities, but against an EU-funded building for Palestinians. On Tuesday, the Israeli government demolished an EU settlement on Mount Scopus in northeast Jerusalem. The city’s municipality said it undertook the measures because the structure was constructed on land, which had been designated for a national park. According to the EU it was not even a building, but a temporary shelter, which the pan-European organization has continued to fund to help displaced people. "We condemn today's demolition of temporary shelters funded by the European Union... as part of its response to the needs of the affected communities," an EU statement said, according AFP. The EU has helped to fund around 200 temporary structures, which are used as shelters mainly for the Bedouin communities, which are traditionally semi-nomadic tribes that stretch from North Africa to the Middle East. The Israeli government has often tried to move the Bedouin people into housing planned by the state. Israeli activists say this is taking place so the government can build its own settlements in the area. This would effectively carve out an Israeli enclave running through the middle of the West Bank, thereby making it almost impossible to create a contiguous Palestinian state. The charity Oxfam made a statement just days before the demolition, saying the EU needed to take a tougher line against the Israeli destruction of Palestinian homes, many of which were funded by EU taxpayer money. "To see positive change on the ground, Europe needs to step up and take a leadership role. EU governments must match their words with urgent and concrete measures to push for an immediate end to settlement construction and the unlawful demolition of Palestinian civilian infrastructure,” Oxfam mentioned on its website. Regavim, an Israeli conservative non-governmental organization counters the EU’s claims, saying the body has built 500 structures in Israel, without the consent of the national government. “After years of researching this new phenomenon of illegal European settlements in and around Jerusalem, we praise the Jerusalem municipality for beginning to enforce the rule of law,” said Ari Briggs, director of Regavim, cited by the Jerusalem Post. A recent report by the right wing lobby group found that the EU’s policy of continuing to illegally build settlements of the Palestinians in Jerusalem and parts of the West Bank is an ongoing problem and they want the Israeli government to continue to take measures against this. “We see this action as a direct consequence of the recent Regavim expose on the subject and call on the government of Israel to find an immediate solution for the other 499 structures that we have identified as illegal EU settlements,” Briggs, a co-author of the study, said. Israel occupied East Jerusalem in 1967 and later annexed it. This is a move that’s never been recognized by the international community, while Israel’s continued policy to build settlements has brought condemnation from all over the world, including from the country’s staunch ally, the United States. In late January, the US and the EU advised Israel against a plan to drop its plans to construct an additional 450 settlement homes in the West Bank, warning that failure to do so would further destabilize the situation in the region and diminish prospects for peace. Washington voiced concern, warning that building new settlements would not help to improve Israeli security; rather it would have the opposite effect. “I can tell you that issuing tenders like this does nothing to bolster Israel’s security, does not increase its prosperity and it does not further the cause for peace. In fact it does precisely the opposite,” White House spokesman Josh Earnest said. The US believes Israeli settlement activity is “illegitimate and counterproductive” to achieving a two-state solution, Earnest told reporters. Some 500,000 Israelis have settled in the West Bank and East Jerusalem, among 2.4 million Palestinians. The Israeli occupied territories have been seeking full Palestinian statehood and independence from Israel for decades. However, despite international criticism, the Israeli government encourages the Jewish population in the West Bank to build new settlements. Rather than listening to the US and the EU, Israeli seems as though it is determined to plough a lone furrow and in 2014, set a new 10-year record for the number of settlements built. 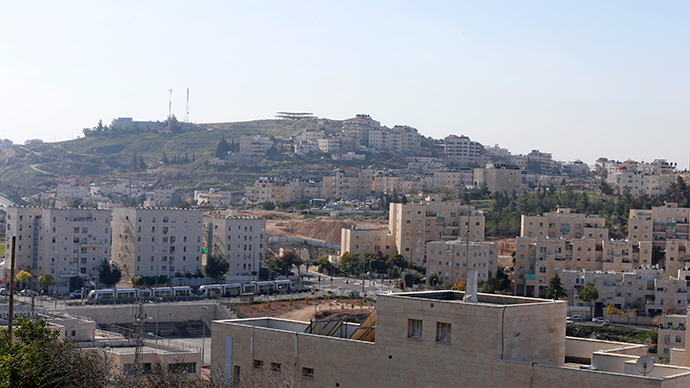 According to Peace Now, an anti-settlement watchdog, 4,485 tenders were issued in 2014, a 20 percent increase from the previous year (3,710). In 2007, only 858 were handed out. The watchdog also stated that there had been a 40 percent rise in construction in 2014. Peace Now claims the increase in settlement building is an election ploy by incumbent Prime Minister Benjamin Netanyahu to win votes ahead of the Israeli elections on March 17. The group adds that the in seeking a fourth term in office, Netanyahu is sacrificing good relations with the US, to secure the settlers’ votes. “Once again, Palestinian lives, rights and lands are being violated in the service of Israeli election campaigns,” said Hanan Ashrawi, a senior official from the Palestinian Liberation Organization, as cited by Reuters.